Regain The Power Of Your SEnses! The precision that image-guided surgery technology provides, surgeons are able to create an exact, detailed plan for the surgery where the best spot is to make the incision, the optimal path to the targeted area, and what critical structures must be avoided. The technology allows surgeons to view the human body a dynamic, three-dimensional structure itself in real-time 3D. The technology creates images that allow surgeons to see the abnormality, such as a brain tumor, and distinguish it from surrounding healthy tissue. 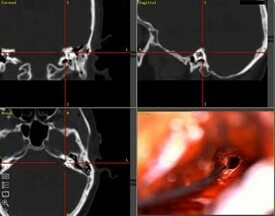 It also enables them to manipulate the 3D view in real-time during surgery. The constant flow of information helps surgeons make minute adjustments to ensure they are treating the exact areas they need to treat.